Think of Barcelona, and what comes to mind? It’s one of those cities that’s far larger than itself, with a personality and reputation so distinct that long before you walk the streets paved with art (literally, thanks to the likes of Joan Miro), spied the towering twisted of Sagrada Familia or breathed in the air at Barcelona FC, you’re likely to have a pretty firm impression of what you’re in for. But how much will that impression match up to reality? Well, that all depends on when you visit, your mood, the tourists and locals you encounter. Because each day in Barcelona is different, and every alleyway, road and cable car leads to a new experience. You’re bound to come up with your own, but for now here are my top ten. The beautiful Palau Nacional houses the MNAC, the Museu Nacional d’Art de Catalunya. As you enter the museum you’ll find a flight of stairs leading up to the roof terrace, offering sweeping views over Plaça d’Espanya and the city beyond. 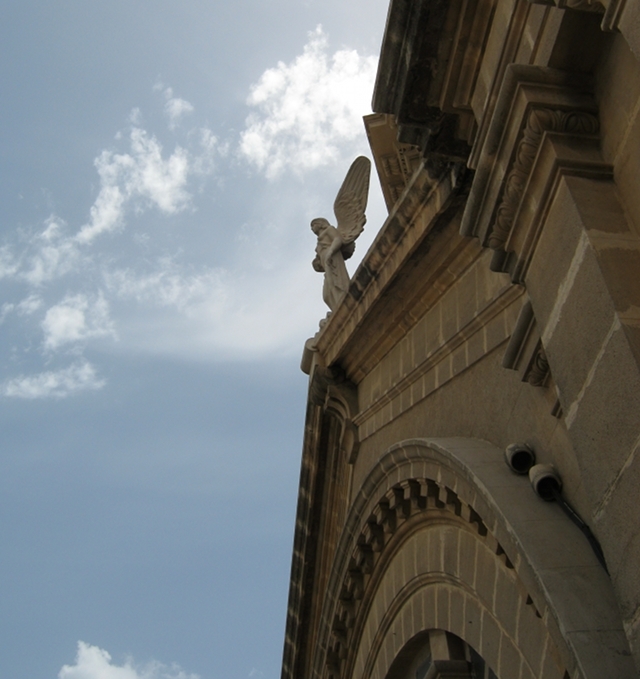 Hang about a bit and you’ll hear the haunting murmur of the wind creeping through crevasses and around the turrets – as though the angel perched on top is uttering a lament in the voice of the sea. Along with the parrots, pigeons and tourists, the locals flock to this large leafy park on weekends and bank holidays. It’s a big enough space to ensure it never feels crowded, and there’s a great little boating lake where you can row to your heart’s content. 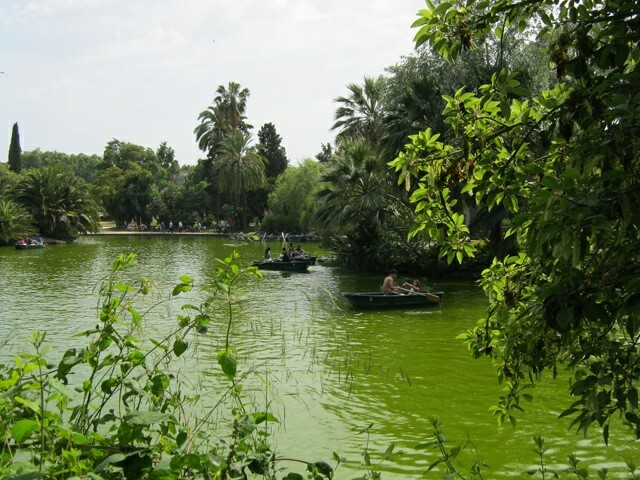 Just don’t fall in – that water is a worryingly vivid shade of green! 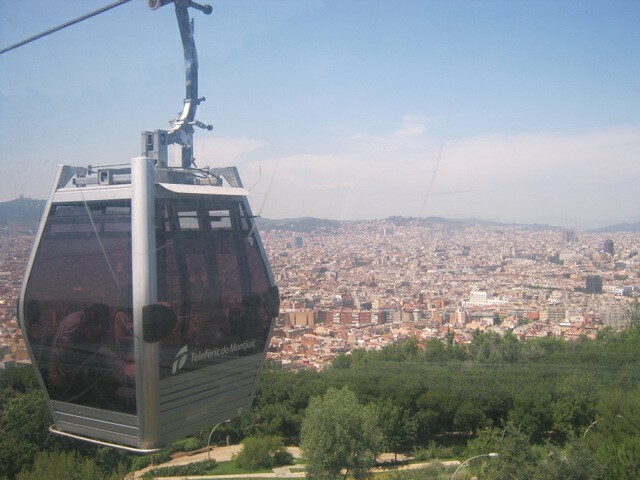 What better way to see the city, and scale the heights of Montjuïc? Recently refurbished, it’s a lovely way to swoop 84.5 metres over the inclines of Montjuïc and take in the views over the port from the top of the hill. 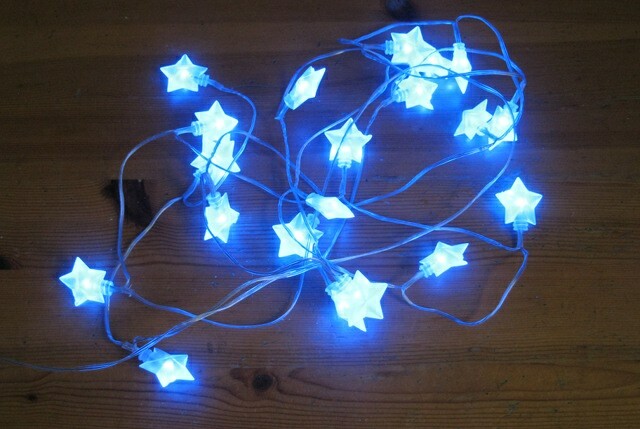 It costs around €10, so not too pricey either. Everyone says it, and it’s true, the tapas and pinxos are to die for. 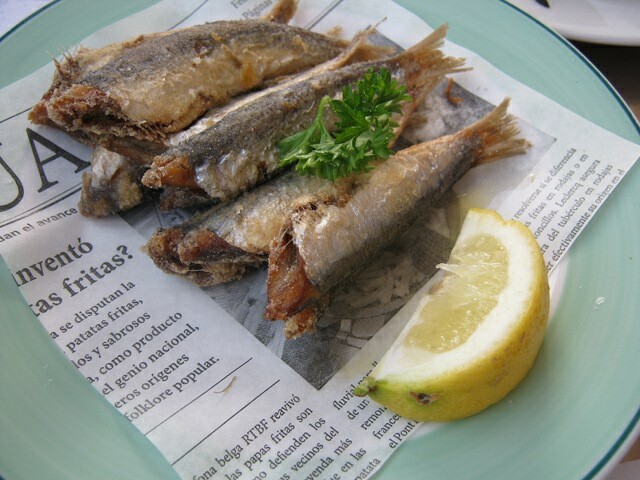 The seafood, like these beheaded sardines, are highlights, as are the salty fried Padron peppers. Save room for dessert – the turron ice cream is the perfect end to any meal. 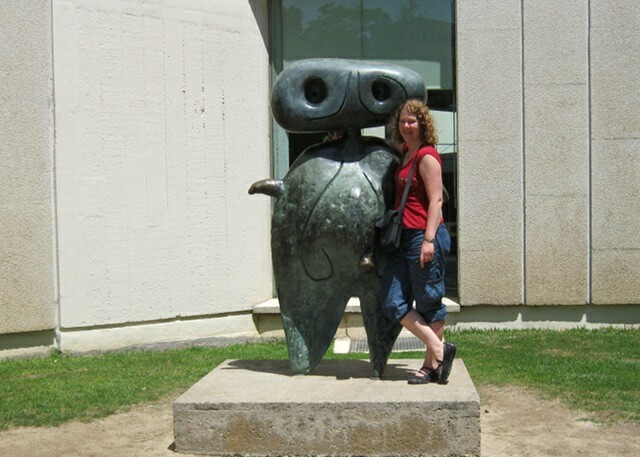 This rotund little fella stands outside the Fundacio Joan Miró and he’s definitely friendly. Venture inside to see the great artist’s sculptures, paintings and remarkable tapestries, mostly named Bird, Woman or Woman and Bird. 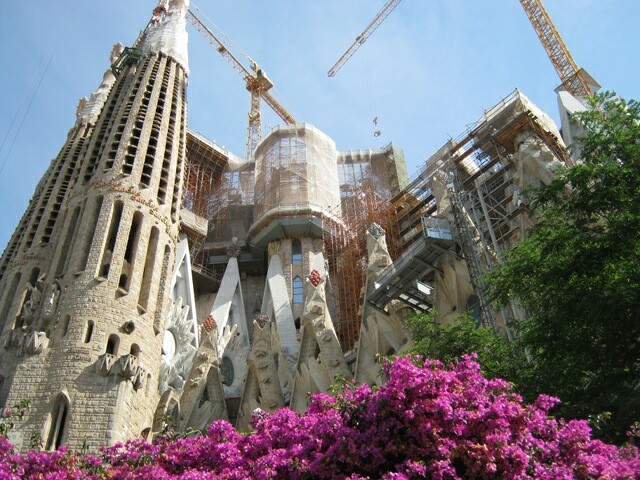 Even if you can’t face the hours of waiting to get inside, hop off the tourist bus at Sagrada Familia to ogle the extraordinary neverending story of Gaudi’s masterpiece. Each façade has different points of interest, and the cranes themselves add to the striking scenes. I couldn’t resist photographing the builders too – thanks to Gaudi’s legacy they’re now part of something remarkable. 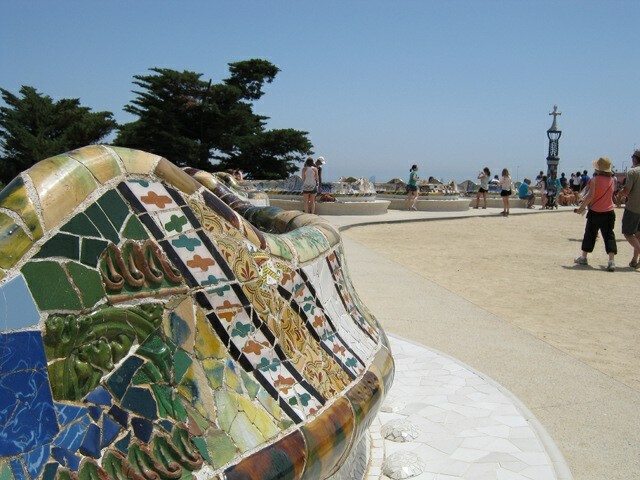 Talking of Gaudi, of course you need to visit Parc Güell. Yes, it’s crowded, yes, the toilets are horrible, but the setting and the many glories from the Greek Theatre (aka the Nature Square, pictured at the top of this post) to the sweet dribbling dragon, make this all worthwhile. Then there’s the Casa Batlló and Casa Milà aka La Pedrera, and numerous other Gaudi bits and pieces to enjoy. Once you’ve experienced La Rambla (keeping a tight grip on your belongings) keep going until you pass onto the Rambla de Mar, a bridge that stretches out onto Maremagnum, a leisure complex with shops, restaurants and cinemas. On busy days the press of people will force you to take your time. I recommend pausing at one of the seats to enjoy views over the water and of the Stargazers, two white buoys topped by skywards-facing figures by Robert Llimós. There are no shortage of literary haunts in Barcelona, where you can listen to up and coming poets and writers share their work – and possibly even have the chance to perform your own. 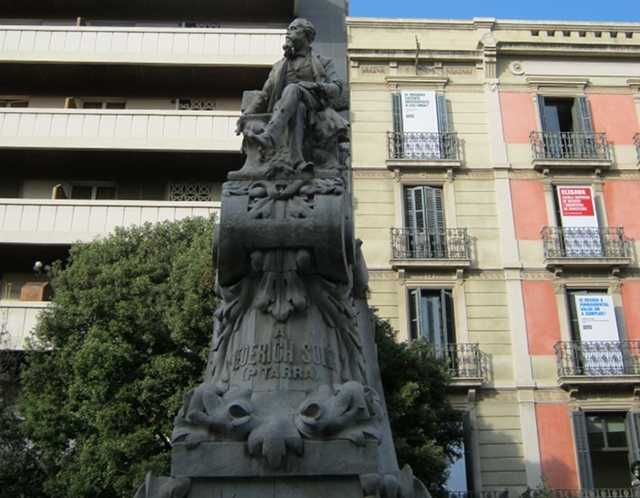 The city also offers up plenty of statues and monuments to poets, including this one of Pitarra, a poet and playwright from Barcelona, set just off La Rambla beside La Plaça del Teatre. For a more romantic literary homage, head back to Montjuïc where each of the gardens is named after a poet who wrote in Catalan. 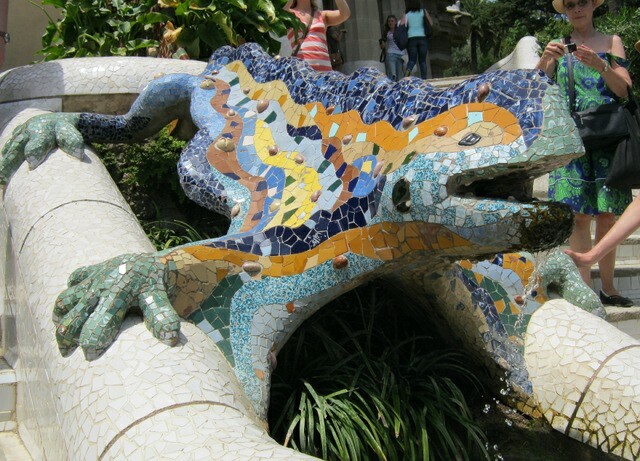 Okay, a pretty easy one, as artwork crops up all over the city – even children’s slides are works of art in Barcelona. 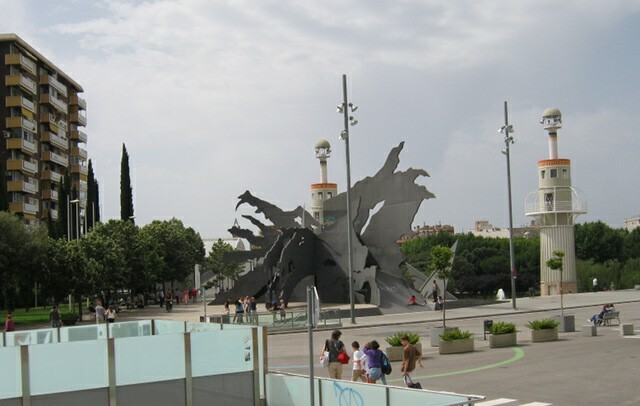 This one by Andrés Nagel is called Dragon Without Saint George, and sits close to the Barcelona’s Sants railway station. 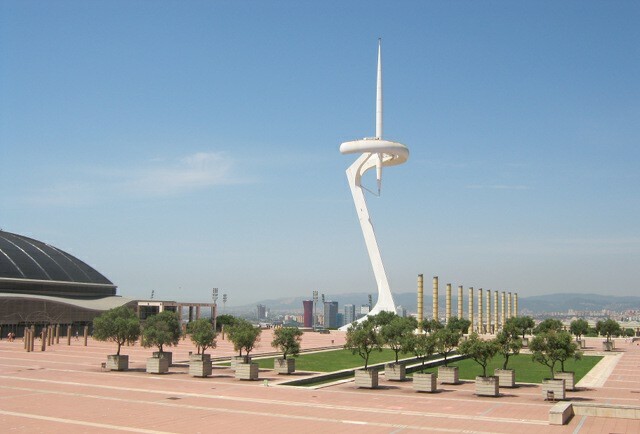 … or rather, a communications tower designed to represent an athlete carrying the iconic flame. This one caught me by surprise. While the height of the tower means you spy it from afar, it’s only when you enter Barcelona’s Olympic Stadium that you grasp the sheer scale and majesty of Santiago Calatrava’s creation. 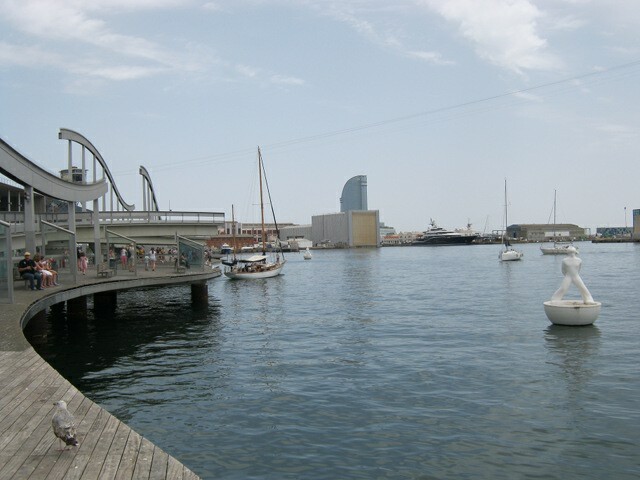 Find more Barcelona highlights at barcelonaturisme.com. Do you ever write as a form of therapy? Writing for health is way to take control of your world, and make sense of it. In a candid guest post, Fiona Sinclair offers an insight into how writing poetry has impacted on her emotional and physical wellbeing. I have had a stop start relationship with writing. I first began when I was twenty. I remember my excitement at being published in ‘Purple Patch’ which had just started and I received a charming letter from Geoff Stevens. I recall too getting paid £5 for a poem from ‘The Lady’ magazine no less! Life events overtook me in my late 20s and I found that great unhappiness crippled any desire to write. Free to resume my life in my 30s, I went to university. Funnily enough, studying great literature thwarted any return to writing on my part. I felt humbled by writers such as TS Eliot and Seamus Heaney. 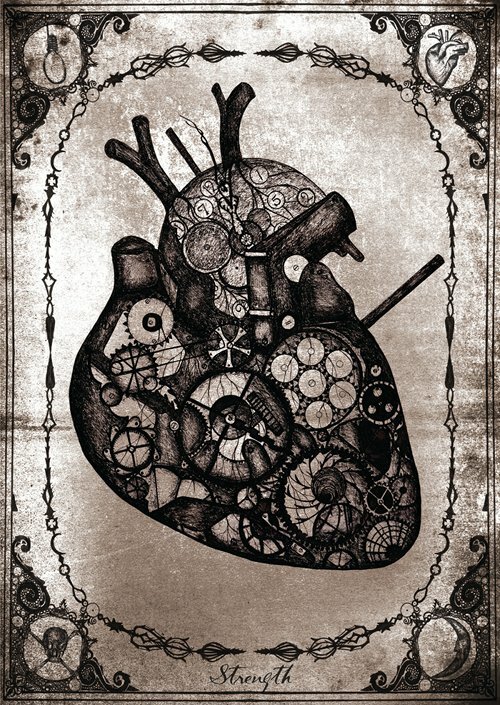 It seemed as if everything been written about the human condition. So why bother? Going on to teach English at Secondary school level eroded my love of literature. Reading became homework and to teach well I simply had no free time. Ironically it was becoming ill that started me writing again. It was discovered that I had suffered from, amongst other things, depression for decades and once a course of CBT (Cogntive Behavioural Therapy) and medication kicked in, it opened the floodgates. However I made a deal with myself that if my work was rubbish I would not bother. The world did not need, I felt, another bad poet. My first poems were sent out to modest magazines. Some wrote back encouraging letters and a few took my work. By this time ill-health, both physical and mental, meant that I was only working part time so I was able to write for longer periods of time but I was still only averaging a handful of poems a year, since school work still needed to take precedence. Nevertheless as my work improved I began to be placed in better magazines. By this I mean the live list of magazines on the Poetry Library website. These are the periodicals any aspiring poet should aim at. It was when I developed a balance disordered and became house bound that, ironically, I was able to write every day. Writing saved me, giving me a vital outlet when I was unable leave the house for three years. During this time the poems that were to form my first pamphlet ‘Dirty Linen’, simply poured onto the page. They charted the life I had led with my beautiful but flawed mother during my 20s. I published as I went along, in magazines such as the now defunct ‘Poetry Monthly’ and ‘Snakeskin’. I always seek publication of every poem I write. It is the only means I have of judging if it is any good. When it is accepted I then place the poem in a file that will form my next pamphlet or collection. By the end of that year I had a complete narrative and sent the MS to publishers I found in The Writer’s Handbook and online. There were, of course, many rejections. Then, one Saturday while I sat watching Strictly Come Dancing, the phone went and it was Doug from Koo Press, Scotland. We spoke for an hour and he explained how intrigued he had been by my story. All through our conversation I kept thinking ‘but are you going to publish my pamphlet?’ At the end of the call he confirmed that he was. I can scarcely describe the feeling. For the first time I felt like a proper writer. I received mixed reviews for Dirty Laundry. But I accepted that the reviewers were correct about my style, it was much too baggy and prose-like – a fault I still tend towards. Clearly I needed to improve my technique so I acquired a copy of Steve Kowitt’s In the Palm of Your Hand: The Poet’s Portable Workshop. This was revelatory. I suddenly understood the concept of ‘show don’t tell,’ which has become my mantra. 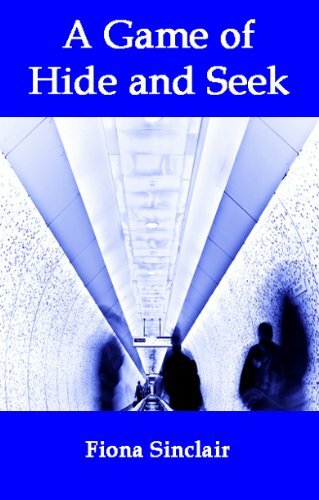 My next two mini collections, A Game Of Hide And Seek and Wonderland were accepted by Indigo Dreams Press. They were fabulous products, being glossy – like ‘proper books’ but again, even though I had improved some poems were still too longwinded. Influenced by poet Sharon Olds, I had taken to writing in block form, not giving a thought to my poor reader. I think part of my problem lies in the fact that my poems tell stories hence their predisposition to being prose-like. However I know that my strength is my language – I have a way with similes often employing black humour as well. My first full collection was recently accepted by Lapwing Press and on initial sight of this beautlul book I burst into tears – overcome by seeing the culmination of seven years’ work. I have since revisited the’ baggy’ poems from my first two collections and have re-written them, cutting them down to quarter of their original size. There is something rewarding about severely editing work in this manner! I try to remember my first publisher’s advice that I am creating art and must not be bogged down by facts. When I was able to get out and about, albeit with some strong medication, I began to attend a local poetry meeting in Canterbury. My aim was to mix with and listen to other writers. The ‘SaveAS’ poetry group have been instrumental in encouraging me to read my world aloud, which terrifies me to this day; the group also organises book launches. Such launches are an ordeal for me but I know that every poet has to get out and self-promote in order to sell books. Kent, where I live, doesn’t have many such venues but I do my best to read my work out where I can. I even undertook a speech/reading with the WI recently, which was quite an eye opener! The fact is that I am an average poet in the midst of many fine writers. I’m suitable fair for small presses, although it still amazes me that they choose me over any other writer. I know that neither Blood Axe or Faber are likely to come knocking, however I think of myself as a work in progress and want to continue improving making my work a viable proposition to small publishers. Moreover, writing every day is good for me. It gives me a routine and orders my thoughts. It still seems to work as therapy. I would not say that I enjoy writing. In fact, I have to force my poor old brain to get working at times. However the results are pleasing and I get a strong sense of accomplishment. Fiona Sinclair is an ex-English teacher. 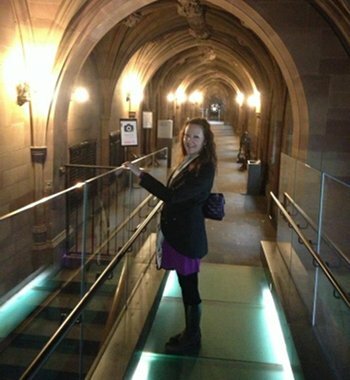 She is the editor of the online poetry magazine Message In A Bottle. Her work has been published in numerous journals. Fiona’s first full collection ‘Ladies Who Lunch’ will be published by Lapwing Press, Belfast in September. Her pamphlet ‘Write Me Into Bed With Casanova Craft’ was published in May 2014 by Original Plus Press. Fiona loves handbags and Fred Astaire. Find out more at www.fionasinclairpoetry.com. If you would like to share your own writing journey on SkyLightRain, get in touch! Just send an email with a line or two about your proposed guest post to Judy(at)socketcreative.com. 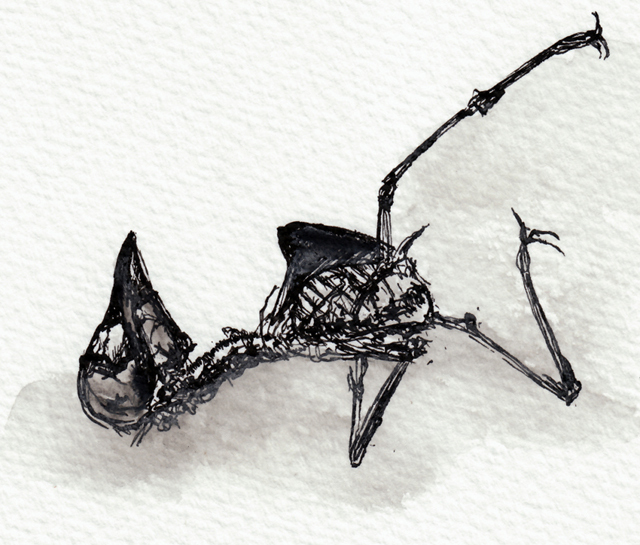 I first discovered the artwork of Rachel Falber thanks to her creepy, kookie skeletal sketches – being the kind of person who will pause to photograph a dead bird on the street, I see something beautiful in the slender, twisted bones that might leave others cold. I think Rachel’s skill is in highlighting that unexpected and somewhat troubling elegance so far more people can appreciate it. However, it turns about that there is much more to Rachel’s portfolio – in fact, it’s her “wildlife and general nice things” that got her started. 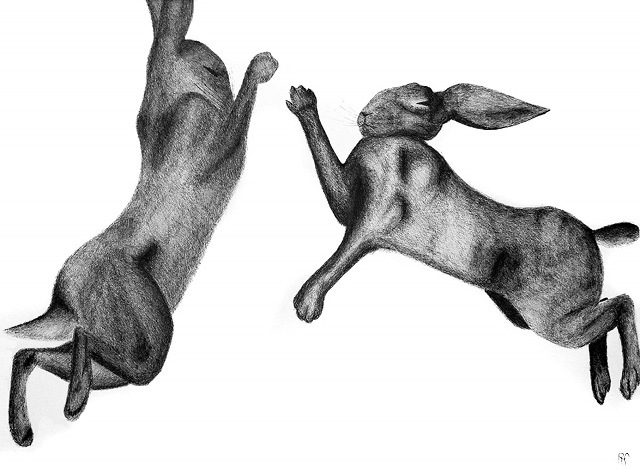 “I studied it at Falmouth Uni, and decided to go into illustration after being offered an exhibition at a gallery in Bristol of massive drawings of hares!” she says. I love the balletic movement in this piece, and the way the hares have their eyes tight closed – almost as though lost in a private moment of ecstasy. It’s the eerier pieces that particularly intrigue me, though, and, it seems, Rachel too. 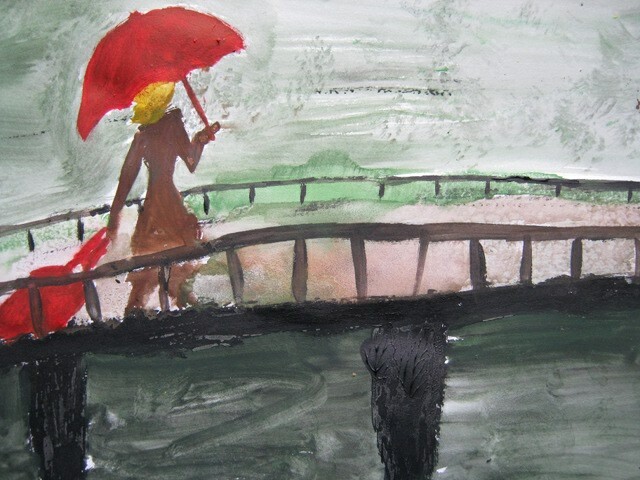 Know an artist you’d like to see showcased on SkyLightRain.com? Give me a shout at judy(at)socketcreative.com! I encountered this display as part of an exhibition at Manchester Art Gallery in May 2011. I was about to fly to Tunisia to discover the country’s efforts to revamp their tourist industry in the aftermath of the Arab Spring, so the heaps of suitcases seemed particularly apt. 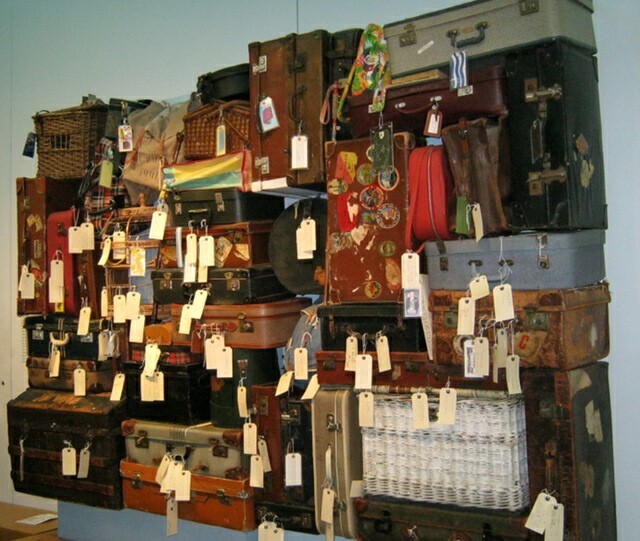 I invite you to take a flight of fancy and select one of theses cases as your writing prompt. Who does it belong to? What’s inside? Where are they going? What excitement, stress or joy lies ahead? Often, I find fiction the best way to gain an insight into the human side of political events. 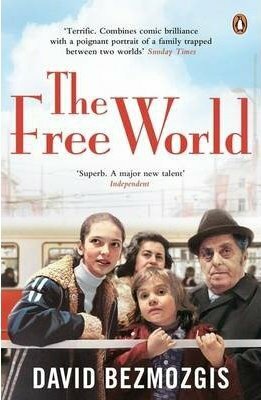 In the case of The Free World by David Bezmozgis, it’s the exodus of Jews from Russia that’s explored, and the impact of this journey on the people who leave, as well as those who remain behind. It’s 1978 and a train takes a family from Latvia to Vienna to Rome in search of a new life – the destination is less important than the act of departure itself. 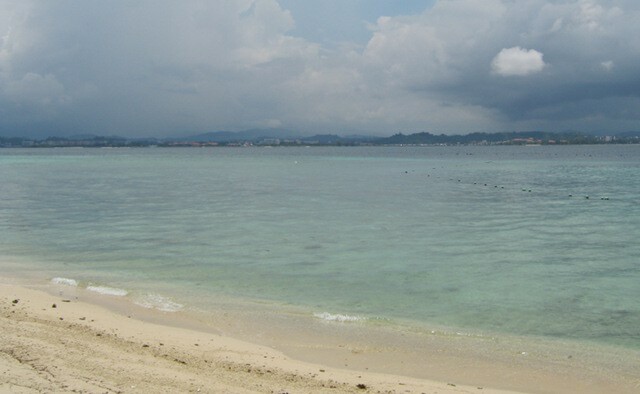 Alec and his wife Polina, his brother Karl, Karl’s wife Rosa, their sons and Alec and Karl’s parents Samuil and Emma, make up a hopeful, sometimes fearful, frequently exhausted and exasperated group of travellers among the huge volume of émigrés realising how different the rest of the world is to the place they left behind. Virginia Woolf is one of those literary legends it’s easy to feel you know, thanks to her crisp, taut prose and thoroughly frank diary entries. Now you can get to know the great author in a whole new way, with an exhibition to be held at Britain’s National Portrait Gallery. Virginia Woolf by Vanessa Bell 1912 © Estate of Vanessa Bell, courtesy Henrietta Garnett cr National Trust, Charles Thomas. Virginia Woolf: Art, Life and Vision will feature painted portraits, photographs, drawings and rare archival material, including a letter from Virginia to her sister, Vanessa Bell, written shortly before her suicide. Guest curated by biographer Frances Spalding, the exhibition promises to explore Woolf’s many facets, novelist to public figure, intellectual to campaigner, as well as offering vivid glimpses of her private life. Via an array of archival material, including letters to and from her friends and acquaintances, extracts from her personal diaries, and original books that were first printed through the Virginia’s beloved Hogarth Press you’ll get to meander through Woolf’s early life, literary interests and remarkable achievements, absorb her fascination with London, awareness of modernity, and her developing feminist and political views. For me, these two portrait of Woolf by her sister seems to offer a glimpse the great writer in a moment’s introversion. I wholeheartedly intend to find the time to go along, but can’t promise I won’t be pretending to myself that I’m actually spending the afternoon with the literary lady. Wouldn’t it be fab to discover her take on today’s political, feminist and cultural issues? VIRGINIA WOOLF: ART, LIFE AND VISION runs from 10 July until 26 October 2014 at the National Portrait Gallery, London. Last week I discovered that one of my very short tales, Capsized, has been selected for the Literature Works’ ‘Writers’ Bites’ podcast. As well as having written the piece, I had to supply the MP3 recording of myself reading it, which turned out to be pretty easy with a little help! At less than three minutes long, it’s ideal for a brief break from whatever you’re working on. If you enjoy that tiny flash, you might want to attend A Night of Flash Fiction, happening at the Lansdown in Bristol on 21st June to celebrate National Flash Fiction Day. I’ll be reading brief tales along with Tania Hershman, Kevlin Henney, Calum Kerr, Lucy English, and other talented writers. If you can make it, please come along! It would be lovely to see you. I discovered the art of Katie Timoshenko thanks to a conversation with writer Rebecca Lloyd, who mentioned her paintings as an inspiration. I can see why. 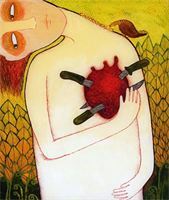 Each of her creations feels like a scene from a self-contained story – bringing to mind fairytales and dystopian myths. There’s a delicious uneasiness to her visions, and a humour that’s both alluring and unexpected. 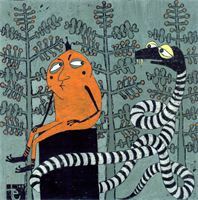 The same is true of her fantastical creature artworks, which often comprise odd pairings such as ‘Dog and Horse’ (at the top of this post) or ‘Frog and Serpent’ (left). The frog, versions of which turn up in several of Katie’s paintings, are particularly whimsical, showing an amphibian I’d be quite disconcerted to find in my pond. She’s even got a pair of ‘Bees’! Dawn was keen to showcase Katie’s unique visions at her ethical, Peterborough-based gallery, Art in the Heart. More recent pieces, including Nature of my Soul, (now hanging on Rebecca Lloyd’s home), depict a happier, more serene frame of mind, but one that still benefits from Katie’s unusual way of seeing, or looking, at the world. Katie Timoshenko’s work will form part of a special exhibition at Art in the Heart, 47 Bridge Street, Peterborough PE1 1HA, as part of the Peterborough Artists’ Open Studios from 28 June-13 July 2014. For details visit www.artintheheart.co.uk. Last week author, activist, teacher, and poet Maya Angelou died – a tragic loss for the world. In her honour, this week’s #writingprompt draws inspiration from one of her quotes. Present one of your characters with any combination of the above challenges, add a goal such as a special celebration to prepare for, and see how they get on. It’s not often I emerge from a collection of short stories without a clear image of the person who’s written them. This may sound strange, but inevitably, once you start reading stories en masse, you start accumulating clues about the author: their preferences, their preoccupations, even, dangerously, their personality. 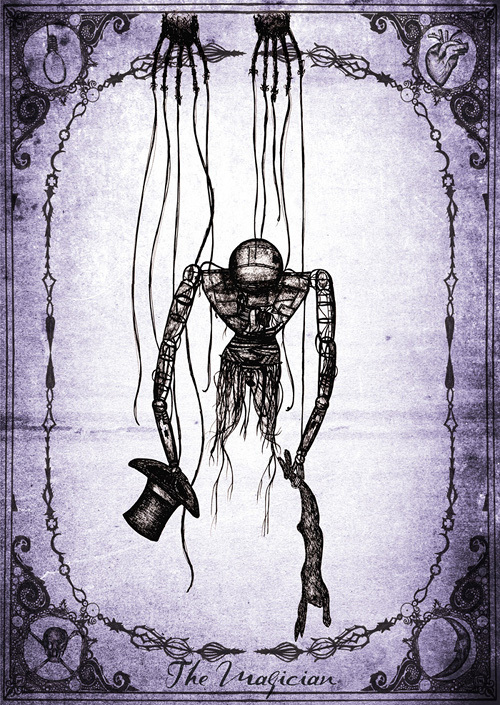 You’ve probably picked up the wrong clues, or misconstrued innocent fictions into facetious facts, but the fact remains – a collection gives the impression of the person behind the tales. Usually.